Oldhammer Forum • View topic - Project Freehack! Board index ‹ Other ‹ B.L.O.O.D. • Provide a professionally layed out, beautifully illustrated and always 100% free retroclone that will keep interest in Oldhammer and Herohammer alive. • Provide a streamlined set of rules that reduces ambiguity and presents the positive qualities of these old games to a new generation in a way that is accessible and engaging. • Allow the input of the community to guide aspects of the design. • An "official" game or a commercially supported game. • It is not intended to be a publishing basis for derivative works that might be monetized. Games Workshop has made very clear in their Intellectual Property statement that they are more than happy to permit unofficial scenarios, campaigns and so on to their games so long as they are not sold for money and they do not make undue use of Games Workshop copyrights. People interested in making such scenario packs and similar supplements can do that without the need of a retroclone. This post is subject to change. Please check back for updates. Please PM Galadrin for a working rules document once it is announced below. All community discussion can be read below. - As per 4e, but Rallying Phase comes at very end (test to rally and, if failed, move fleeing units by dice roll, as per 4e). That way, if a unit flees combat, it will have a one turn head start after the initial pursuit. Intended to make units flee and return to battle multiple times in a single game. A unit must be at least 8" from any enemy in order to rally. - Combat by initiative, but double initiative for charging unit. Dice off initiative ties each round. Intended to make Initiative more dynamic when charging or recieving the charge. For example, Orcs (I2) vs Humans (I3) or Humans (I3) vs Elves (I6). - Strength 5 reduces armour save by -1, S6 by -2 up to S10 by -6. No armour penalty from S4. Intended to make armour more prevalent. - You can only kill models which you can touch. Intended to curb the dominance of powerful characters and monsters. - Weapon rules from 4e, except Additional Hand Weapon is +1A, -1 to Hit and -1 Initiative. - Armour Save roll of 1 always fails, even for 1+ Armour Saves. - Flanking with a regiment of at least 5 models negates rank bonus. - Combat Resolution reduces Leadership for break tests, as per 4e. This is curbed by the reduced deadliness of combat. - Dice roll flee and pursue (as in 4e), but fleeing unit not destroyed if caught. Rather, attacker gets free hack (all attacks automatically hit, no shield bonus to armour save). - Frenzy adds +1 attack instead of double attacks, but otherwise unchanged from 4e. - Army-wide panic tests when General is slain. - As per 4e. Opponent must approve any choice that is either a Special Character or more than 33% of your army points. Well, after some playtesting and number crunching, I am rolling back a few of the proposed changes and submitting a few new rules for testing. • The changes to armour saves had resulted in too powerful heavy cavalry, with fewer ways for several armies to beat them, so I am tentatively returning to the 4e armour save modifiers (-1 for S4, -2 for S5 and so on). With the modifiers back to normal, I can also drop the 6e rule that a 1 on an armour save always fails. • I am also dropping the 5e rule that flankers remove rank bonus and going back to the 4e rules where rank bonus was never removed. I found that rank bonus is far too important for regular line troops, and the 5e rules really weakened them. There is enough advantage from maneuvering and flanking an enemy (including the panic test), so there is no need to add further incentive. • Gentler break penalties to leadership. Instead of using the difference between Combat Resolution as the penalty, you use the multiple. Thus if one side has higher CR, the other side takes a break test at -1 LD. If the winning side has double or more the CR, the test is at -2 LD. If the winning side has three times the CR or greater, the test is at -3 LD (which is the maximum penalty). If for some reason the losing side has 0 CR, then you still use the difference (with a max cap of -3 LD). • Rebalancing Combat Resolution for small units. I am considering counting rank bonus to CR from the first rank instead of the second (although the limit of +3 CR remains). Since this benefits heavy cavalry a lot, I am also considering adding the 6e bonus for outnumbering. Outnumbering is simply calculated by the Wound characteristics of every model in the regiment. 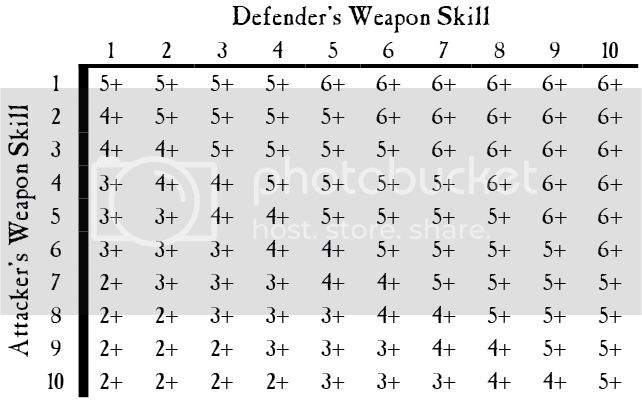 • Some tweaks to weapons: two-handed weapons do not automatically strike last when charging, halberds gain +1 to hit mounted models and large creatures, flails gain +2S on the first round and +1S thereafter, the bonus spear attacks only work against enemies to the front (this was never clear in 4e). • Army composition changes: Each character can only have a single magic item. The point cost of the magic item may not exceed a limit determined by the level of character: Lord (150 pts), Hero (75 points), Champion (25 points) and Wizard Lord (150), Master Wizard (100), Wizard Champion (75) and Wizard (50). • When you buy a champion for a regiment, the regiment gets a free upgrade of standard bearer and musician. This is to encourage players to spend some of their 50% character points on the humble champions, which make the game more interesting in my experience. • The freehack for pursuit is excellent. I'm very happy with this change. • The "only attack what you can touch in melee" rule is also doing a great job. It is toning down characters and focusing them on one of two rolls: regiment support (emphasizing moderate attacks, durability and leadership) and monster or hero-hunting (emphasizing heavy damage output with a powerful magic item). Because a character can only attack adjacent models, having 10 S8 attacks (frenzied Chaos Lord with a potion of strength!) can still only kill the two models the character is touching, so it makes sense to send such powerful characters to fight giants and dragons where the extra damage will come in handy. Galadrin wrote: • The "only attack what you can touch in melee" rule is also doing a great job. It is toning down characters and focusing them on one of two rolls: regiment support (emphasizing moderate attacks, durability and leadership) and monster or hero-hunting (emphasizing heavy damage output with a powerful magic item). Because a character can only attack adjacent models, having 10 S8 attacks (frenzied Chaos Lord with a potion of strength!) can still only kill the two models the character is touching, so it makes sense to send such powerful characters to fight giants and dragons where the extra damage will come in handy. While I see where you are coming from I think that you are overdoing it. IIRC, the main issue with such characters was, that they would ususally strike first on a charge, kill the whole front rank while getting static rankbonus from their own unit. That was annoying as the defender was denied the ability to strike back against the attacking unit and thus gain at least some wounds to increase their own CR. Having a Lord of Khorne just kill two goblins due to his base width seems to be too much of a counter move though. Yes, such characters are buzz-saws and they should be able to "wade" into a unit and wreak havoc. It just should not be game breaking. Have you tried to allow killing models in base to base contact and take further kills not from the rank but from the file? That way the number of attacks would still be useful for reaping wounds for CR (which was also changed to lessen the impact of many wounds). Niibl wrote: While I see where you are coming from I think that you are overdoing it. I haven't heard of that method, but it seems like it might be a little more complicated to calculate. I think you're right, though, that there is an underlying issue with attacking without fear of counterattack. This is something that became much more acute in 4e, as models became much more deadly in close combat and the usefulness of Initiative far outstripped its original purpose. 3e handled this by making models much less lethal, which meant striking first removed one or two counterattacks but never the whole front rank. The solution in later Warhammer editions to allow back rank models to step in and strike in combat just made initiative obsolete. Just a few things to note, though, ranks in 5e were counted before casualties were removed (4e was ambiguous about this matter), so a regiment that loses its front two ranks to a charging Bloodthirster would still count them for combat resolution. As far as the "only attack adjacent models" rule, this is the rule that WFB 3e uses. I haven't heard any specific complaints from 3e gamers about the rule, but I'd love to hear their thoughts if it spoiled gameplay. In fact, 3e was even more strict, as a beaten regiment would never take a break test unless they suffered 25% casualties that round. Thus a regiment that was five ranks of five would never take a break test when charged by an enemy, as the enemy could only cause a maximum 5 wounds (and likely much less, due to the 3e to Hit table and armour rules). The Lord or Khorne is perhaps not the best counter example, because a player has to choose to make a Lord of Khorne broken. Let's consider the Bloodthirster instead, who comes prepackaged as a single model with 10 S8 attacks. Is this model made useless with the above rules? Let's assume this guy was on a 50mm x 50mm base, which means he would touch at least three Goblins (and likely kill all three). Meanwhile, the 4e and 5e Bloodthirster would only kill an average of 6-7 Goblins, due to the to Hit chart. Thus a Bloodthirster under these rules is half as effective against Goblins, which is in line with 3e and the aim of boosting regiments and toning down the top 10% of overpowered characters and monsters. In my view, if the goblins overcome their terror check, then they deserve to hold up a Bloodthirster for a couple rounds. One might even argue, under these rules and indeed in 5e as well, it was the mistake of the Chaos player to misuse the Bloodthirster by charging goblins (instead of a juicier target) in the first place. More importantly, by capping the destructiveness of single models, it puts a bell curve on the effectiveness of characters against rank and file regiments, with the best Attack profile hovering around four or five attacks (i.e., what most Lords have on their basic profile without boosting it with magic weapons or other items). Beyond 4 or 5 attacks, characters are subject to diminishing returns (at least against rank and file). I came to this idea after reading a 1990's White Dwarf article that was responding to reader complaints about overpowered characters. The editor replied bluntly, "here at the studio, we often play games without any magic items at all, and we don't see why other people just can't do the same." It was a little bit of a condescending response, and not to the point. Magic items are an interesting part of the game, after all, and to play without them is not as fun. But the core idea stuck with me—Warhammer characters are VERY well balanced against regiments if they stick (more or less) to their basic profile. This bell curve has the same effect, albeit by coming through the back door rather than the front. It also doesn't deny a really powerful stat line. After all, you are going to want the Bloodthhirster's 10 attacks when going up against a dragon. And ultimately that is encouraging big shot models to fight other big shot models (and not the regular foot-sloggers), and isn't that the very stuff that epic fantasy battles are made of? I've been thinking about Niibl's comment a little more. The "no counterattack for dead models" thing really is a glaring problem. That said, I really don't like the WFB 8e answer of allowing models to just "step in" and attack without penalty. Instead, what if slain models got a "parting shot"? Each slain model would be entitled to a single, normal attack at -1 to hit. Since the default to Hit is 5+ in the above chart, this seems suitably punishing to lower Initiative troops that are slain before striking back. It would also limit slain monsters or characters who normally have multiple attacks, since a parting shot would only allow a single attack. Would that be a better solution? Treps wrote: Honestly, as much as I do believe that a pure retro-clone who would let anyone publish supplements of any edition would be a good idea, I do believe that it needs to adhere strictly to a published edition (with erratas). An hybrid edition, taking parts from multiple edition and trying to make the best of them would be a new different game and would complicate things more than help, again, this is just my opinion. What is needed are real retro clones of editions for which people would be interested to publish supplements as it would allow the owners of the original editions to use them without any change. A long time ago, when this forum just started we played a couple of remote WFB games. Out these games we developed a couple of house rules. You can find it under under the rules section. “initiative order” still apply, but are evaluated after each attack. All excess casualties are considered lost. We refer to the “kill only what you can touch” rule. Declare which models strike at which enemy models. When having multiple attacks, make sure to declare how these are divided among the models it can attack. save both wounds only kills one model. The obvious disadvantage of these rules is the extra bookkeeping that comes along with it. Nevertheless, it offers some very interesting combat situations. I like the "only kill what a model can touch" rule, but I'm wondering of the extra attacks could be used as rerolls, in cases such as the above example of attacking three goblins? So, for example, a Hero with 8 attacks who is in base contact with three goblins, would roll all attacks, but only "keep" a number of successes equal to the viable targets?